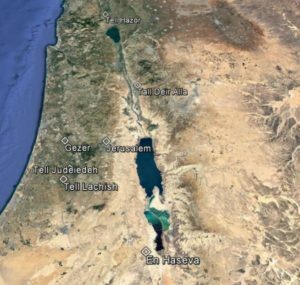 Satellite View of the locations where archeoseismic evidence for the northern and southern Amos Quakes have been uncovered along with the location of Jerusalem. Yadin (1975) and Finkelstein (1999) identified an earthquake in ~760 BC as the cause of seismic destruction seen in Stratum XI at the R=Tell Hazor site. Austin et. al., 2000 added error bars to arrive at a date of 760 BC +/- 20 years. Above is an outer wall that was interpreted to have been displaced to the right in comparison to the part of the wall that is in the foreground to the left. Photo courtesy of William G. Dever and Randy Younker. from Austin et. al., 2000. Ibrahim and van der Kooiji (1977– 1978, 1979) and Lemaire (1985) interpreted foundation cracks and fallen walls in Stratum Phase IX (aka Phase M) to have been caused by an earthquake in 770 BC +/- 25 years (Austin et. al, 2000). Austin et. al. (2000) state – Another fortified Iron Age city of Judah was Tell Judeideh, located eight km northeast of Lachish. Excavations at Tell Judeideh by Bliss and Macalister (1902) showed that the Iron IIb could be divided into two phases. Bliss and Macalister provide no answers to the destruction of the lower phase. 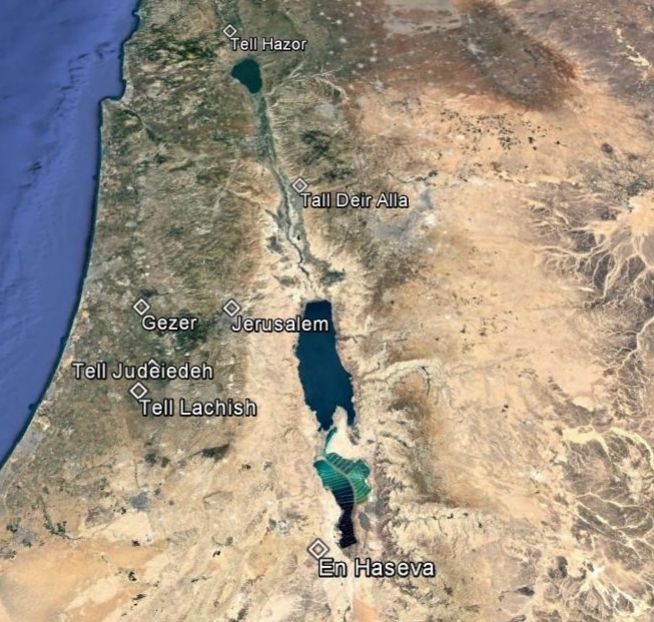 However, Gibson (1994), after an extensive review of the archival materials, noted that pottery of the two phases has strong stratigraphic correlation to Level III and IV of nearby Lachish. He agreed with Ussishkin and Dever that earthquake destruction debris marks the top of Lachish Level IV. Therefore,Gibson (1994, p. 230) concluded that an earthquake in approximately 760 B.C destroyed Tell Judeideh’s lower-phase buildings. 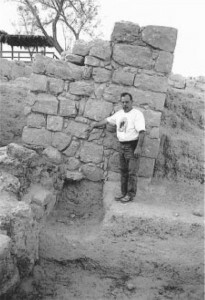 Ambraseys (2009) states- The case for Lachish (Hesy), where the archaeologists consider ‘A natural catastrophe of this sort would, perhaps, be compatible with the earthquake mentioned by Amos’ (Ussishkin 1977, 5; Dever 1992, 35, n. 10; Herzog 2002, 97). Austin et. al. (2000) state – En Haseva was an Iron Age shrine and fortress on the southern border of ancient Judah, 38 km south of the Dead Sea. Earthquake damage within the gate area of Stratum 5 includes walls bowed outward significantly, cracked stones on multiple courses, and foundation failure associated with the uneven compaction of the substrate (Fig. 5). The architectural style of the gate is distinctively Israelite, and, because it occurs within the region of Edom, dates to the southward expansion of Judah during the later part of Uzziah’s reign (2 Chronicles 26:2). 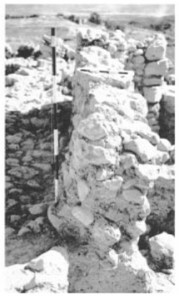 The excavators attributed this damage to an earthquake in the days of Uzziah (Cohen and Yisrael, 1995). FIG. 5 from Austin et. a;. (2000) Their figure caption reads – Foundation failure beneath the inside pier of the fortress gate at ‘En Haseva. 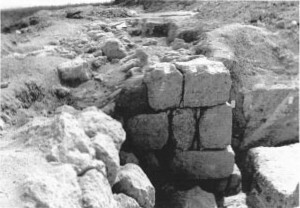 Although the Iron Age fortress gate is superbly constructed of well-hewn stones, individual blocks within the pier cracked on several courses as the foundation compacted differentially. The whole pier of the gate now leans northeastward. The excavators of the gate complex associated destruction debris within the gate complex to damage caused by an earthquake, not foundation failure caused by a continuous process of creep.